This time of year is always confusing when it comes to fashion. The fall clothes are dropping online and in stores while most of us are still experiencing heat waves. This means it’s impossible to wear all the fall trends we’ve been lusting after on the runways without ending up dripping in sweat. Oversized wool sweaters? Nope. Strong-shouldered, mannish coats? No way. Non-breathable vinyl trousers? Proceed with caution. 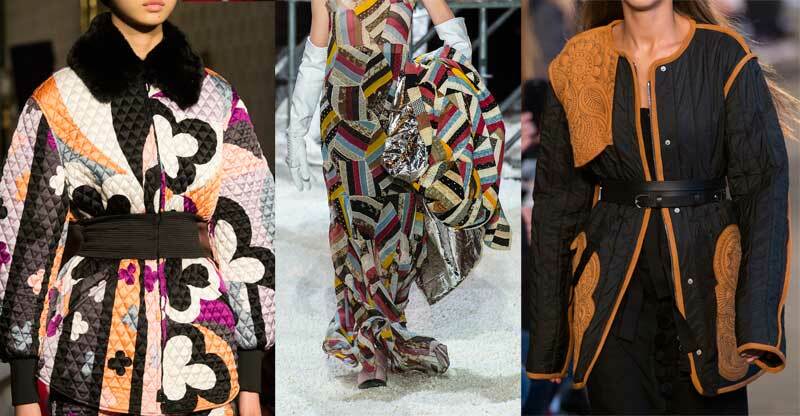 But there’s one fall trend we can work with: quilting. Quilted biker and bomber jackets are mainstays in many fall wardrobes. For Fall 2018, designers took the quilting approach further by incorporating the classic fabric technique into all kinds of garments, from gossamer dresses to skirts to edgy skinny jeans. New York Fashion Week was the biggest champion of the trend with Calvin Klein’s Fall 2018 show featuring breezy, geometric, quilted dresses slashed with risqué sheer panels. Combined with coordinating jackets carried with an insouciant air in one arm, it was more cutting edge than granny chic. Altuzarra and Emilio Pucci stuck with quilted jackets but incorporated bold colors and soft tailoring. Libertine, Bode and Frame also showcased the stitched look in their collections for a chic arts-and-crafts finish. Whether taking a more time-honored look or embracing designers’ latest twists on quilting, there are plenty of pieces to choose from that will work in your wardrobe now. Click through the gallery below to shop the quilted pieces that will make transitioning from summer to fall a breeze.